Gears for Breakfast absolutely created the game they set out to make with A Hat in Time, but didn't do anything all that new or interesting in the process. I often find that Kickstarter titles can be some of the hardest games to review. Given the circumstances behind how these games (like A Hat in Time) are usually developed, I tend to find myself sometimes more forgiving than usual. Instead, I try to focus on whether or not the game’s creator followed through on the pitch of what it is they wanted to make originally. 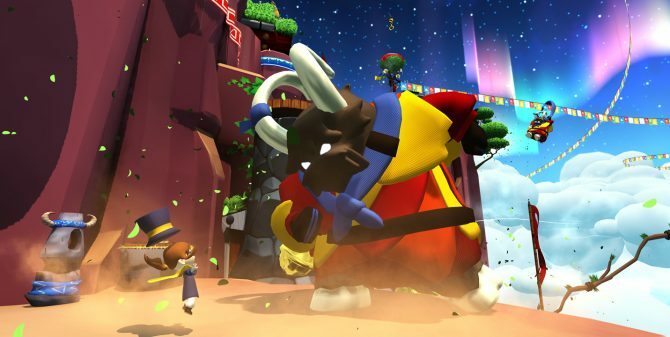 That stated, the long-awaited 3D platformer A Hat in Time achieved its goal of feeling like a game from the Nintendo 64 era, like pitched. 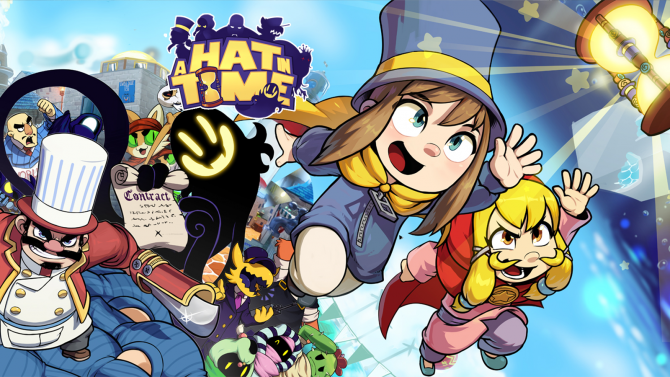 However, as we saw with Yooka-Laylee earlier this year, A Hat in Time keeps things a bit too similar to titles from that period and as a result suffers from the same issues. A Hat in Time finds you in the shoes of a young girl protagonist known merely as Hat Kid. 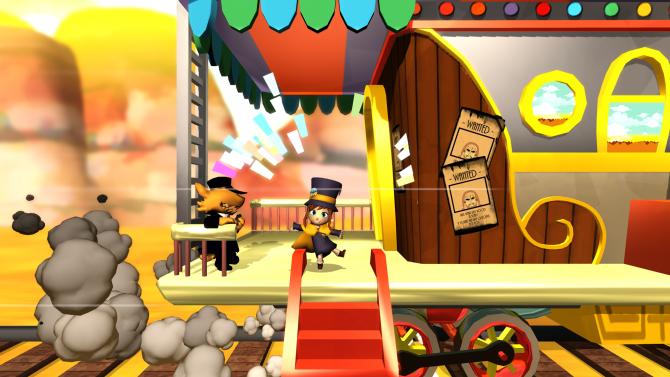 The game opens with Hat Kid aboard a spaceship that is powered by hourglasses. After an accident that occurs in the opening moments, all of the hourglasses aboard the ship are lost and are scattered throughout a variety different worlds. In perfect collectathon fashion, it’s up to you to retrieve all of the missing hourglasses and power back up your ship so that you can return home. While the story is merely a means of getting you to run out into the world, gameplay is typically the reason to play any platformer. A Hat in Time gets the job done when it comes to platforming, but it doesn’t add anything that hasn’t been seen already. Hat Kid can utilize a double jump, has a hookshot that propels her between large gaps, and has a few other nifty moves such as a dive and wall running. A Hat in Time doesn’t win points for originality, but its mechanics are at least solid enough to prevent more extended platforming sections from becoming stale. Things start to get a bit more unique however when it comes to the variety of hats that Hat Kid can wear. Each hat that you create in A Hat in Time — through acquiring yarn collectibles — gives you a new ability. Some of these include the simplicity of being able to sprint faster with the running hat, to being able to jump off of springboards in the environment or do a ground pound with the ice hat. These wearable items add a bit more flair to Hat Kid’s look and allow you to mix up your playstyle more often. Unfortunately, one of my most significant problems with A Hat in Time occurred with the game’s camera. As mentioned before, certain issues in A Hat in Time repeat the sins that 3D platformers some 20 years ago also had with the camera being the most prominent culprit. When squeezing into tighter spaces, the camera can often get too close to walls and throws off your entire vision of the character. I also just generally wasn’t a fan of how the right stick controlled the camera’s movement. If you could time travel back to 1999 and tell a five-year-old version of myself that some platformers almost two decades later would still struggle with the same hiccups then I wouldn’t have believed you — but here we are. Throughout A Hat in Time’s development, it has been described as a “cute-as-heck” platformer, and for the most part I think it lives up to this moniker. The cuteness of A Hat in Time’s world is most easily seen in the wacky designs of each character. From the simplicity of Hat Kid to the funny-looking Mustache Girl to later characters that include a penguin with an afro, the many faces you run into across your adventure is where it endears itself to the player most. Despite not being the prettiest game ever, A Hat in Time’s art direction and quirky character design proves that you don’t need to run at the highest resolution graphics to still remain visually appealing. One of my more significant issues with the worlds found in A Hat in Time is that they just aren’t that fun to explore. Don’t get me wrong, they all have their own sense of unique charm to them, but I found the game to be at its worst when it opened up the entire world to you at once. There just wasn’t much of an incentive to explore as most of the collectibles in the game outside of the hourglasses are unsatisfying to collect. The more enjoyable parts of A Hat in Time occurred when the game siphoned you down a specific path. 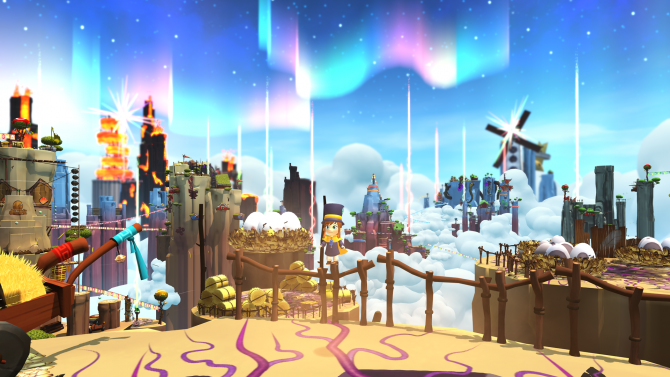 For example, my favorite world in A Hat in Time contains two rival film studios run by birds that are competing to win an award for the year’s best movie with Hat Kid playing the central character each time. Over the course of the five to six levels in this section of the game, you are tasked with completing some incredibly fun objectives that are unlike anything else I’ve seen in a platformer in recent memory. Some of these missions including solving a murder on a train, leading a parade of owls across various rooftops, and hook-shotting your way through explosions. These more focused sections of gameplay are where A Hat in Time truly shines and sets itself apart from others. 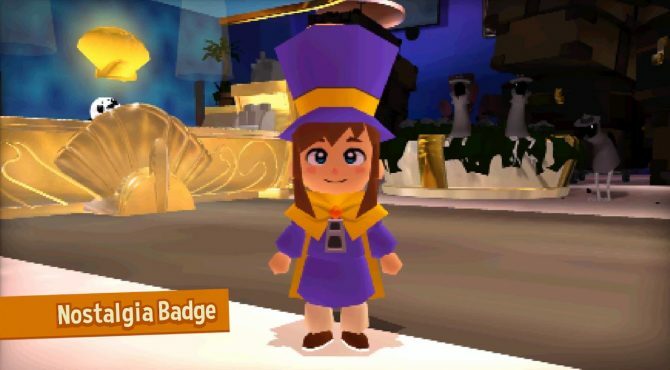 One other thing I feel is important to mention is the overall lack of polish that is found in A Hat in Time. This can include things as simple as characters mouths not moving when speaking as well as seeing a repetition of animations. None of this is a massive problem in the grand scale of things, but the rough nature of the game stood out to me the more that I played it. As I said at the start though, this is one of those areas where I’m more forgiving of A Hat in Time considering it was a crowd-funded title. For being the first game developer Gears for Breakfast has ever made, it’s an impressive beginning venture. I feel like I’ve been a bit hard on A Hat in Time when I do find it to be a charming and fun game. I had hoped for some more originality to be seen in the game’s mechanics or level design, but the lack thereof doesn’t hinder the quality of the experience. 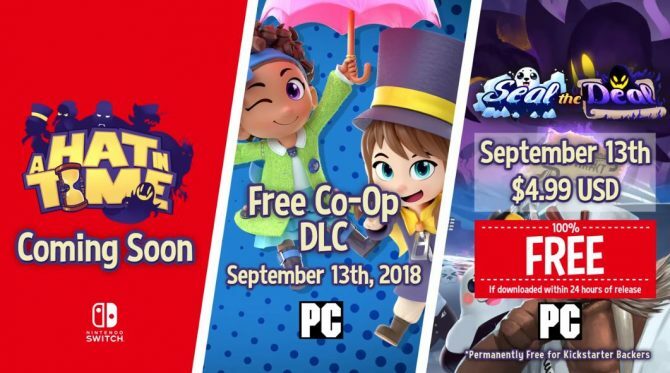 Nothing in A Hat in Time is going to change how you think about 3D platformers, but if you know that ahead of time and are still looking for an enjoyable, cute collectathon, there are definitely worse options to choose from. The Japanese version of the Nintendo Direct that occurred last week had some news on A Hat in Time that wasn't in the US version.